Great performance of this classically trained singer. Mathew Ma on piano. Rose and Chocolate for your sweetheart! Come to join us at Elizabeth Station for great evening of wine tasting. Sponsored by Walton Beverage with special bottle pricing at the event! Walton Beverage, along with local Bellingham Wineries, will be conducting our annual Wine Tasting Event at the Bellingham Golf and Country Club, Friday, April 8th from 5:30 – 8:30 p.m.
Come out and enjoy the soothing sounds of the Heebie Jeebies and taste some of Whatcom Counties best wines! Light finger foods will be provided as well as a light menu for your ordering pleasure. At $15.00 per person this is an inexpensive night out and a way to sample some GREAT wines and who knows, there may even be some dancing! In addition, you will have the opportunity to order wines that evening at a discounted price only available at the event! Please RSVP to the winery if you wish to attend. Another installment in an amazing saga – voice belonging to Broadway – right here in our town! Club members and guests only. Come celebrate with us with great barrel tasting and wine sale. Club members save 20%, general public 15% off. As always – generous portion of salmon, Caesar salad and glass of white or rose all for only $10.00/person. Another installment in amazing series of concerts By Sonia Alexis and Mathew Ma on piano. Songs in many genres sung to perfection with flair and smile! No reservations, seating is limited, come early! Great music, good company and a glass of wine – what a perfect way to spend Saturday afternoon. With limited seating early birds will listen in comfort. Great music with talented Sonia Alexis and Mathew Ma on piano. Great easy listening music by two talented local musicians. Complimentary German Sausage BBQ with all the trimmings and chips! Beautiful 3 course dinner paired with our wines. Our club only semiannual event. $75.00/person. Reservations required. Barrel tasting, food + 30% wine sale at the event only. Another installment in great concert series with singer Sonia Alexis and pianist Mathew Ma. Limited to club members and their guests. Reservations and deposit required. Call 360.758.2958 during business hours. A four-course gourmet dinner paired with some of the region’s top Rosé wines will be presented at 6 p.m. July 17 at Keenan’s at the Pier, one of Bellingham’s finest restaurants located inside The Chrysalis Inn & Spa. Marinated Grilled Prawns with Summer Vegetable Noodles Primavera, paired with a 2016 Gilbert Cellars Rosé from the Yakima Valley. Dashi Broth, Clams, Mustard Greens, Kimchee, Quail Egg and Green Onions, accompanied by a 2017 Dynasty Cellars Rosé from the Walla Walla Valley. Big Eye Tuna Sashimi with Fresh Seasonal Slaw and Sweet Tamari, paired with a 2017 Elk Cove Pinot Noir Rosé from Oregon’s Willamette Valley. Chocolate Mousse with Fresh Berries and Almond Tuille, accompanied by a 2013 Dynasty Cellars Amabille. The complete dinner is offered for $79 per person. Reservations are due July 6 by calling (650) 270-8791. “The Northwest Rosé Winemaker Dinner is for people who enjoy delicious food and some of the region’s best Rosé,” said Suresh Rao of DS Vintners, organizer of the event. It also is presented by Dynasty Cellars and Keenan’s at the Pier. Diners are eligible for special overnight rates that evening starting at $199. The 45-room Chrysalis Inn & Spa (www.thechrysalisinn.com) unites the natural beauty of the Pacific Northwest with warm sophisticated styling. Its hotel, full-service spa, and modern casual restaurant overlooking the calm waters of Bellingham Bay at 804 10th St. welcome guests for a contemporary boutique inn experience unlike any other. Call (360) 392-5558 by June 22 for the special room rate. 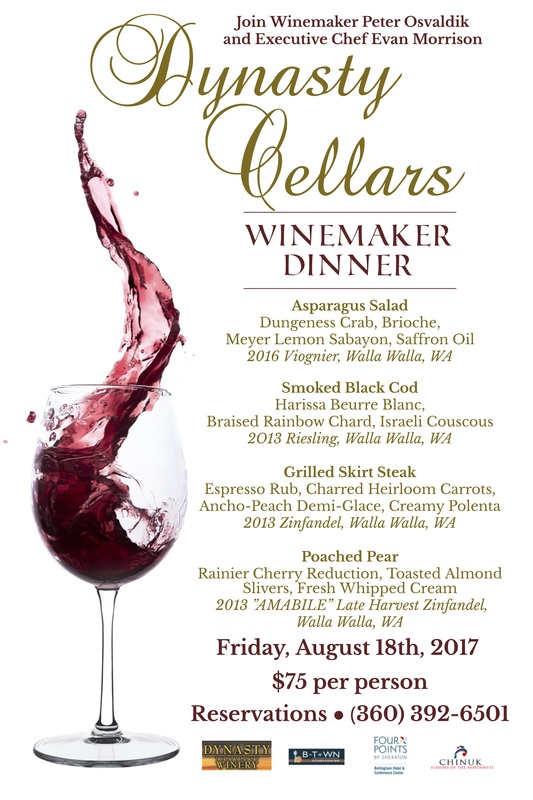 For reservations or more information about the Northwest Rosé Winemaker Dinner, call (650) 270-8791 or visit www.dsvintners.com. Another great concert with Sonia Alexis and Mathew Ma! Come early – seating is limited! Last concert of the season. Great performance by Sonia and Mathew! Giuseppe’s Al Porto is Proud to announce our Wine Dinner Celebration on October 28th starting at 6pm. Wine from Our local Dynasty Cellars hosted by Peter and Olga! We are Proud that Dynasty Cellars makes our house wine just for Giuseppe. A Special dessert will follow.